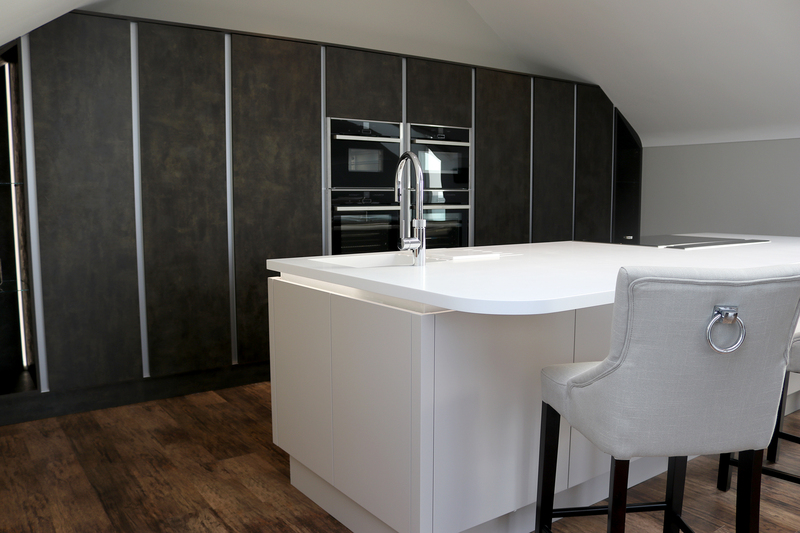 The epitome of contemporary elegance, this luxury kitchen was designed and installed by Meridien Interiors for a leading local developer’s own luxury waterfront home in Whitecliff, Poole. The ‘upside down’ design of the property means that the kitchen is situated on the upper floor within the eaves of the property. Rather than reducing the cupboards to allow for the differing heights, Meridien designed the kitchen with tall units scribed into the eaves thereby achieving the symmetrical, linear look that complements the contemporary lines of the property, but also ensuring maximum storage space. The ultimate in pared down style, this kitchen features a ‘soft’ monochrome colour scheme with bespoke tall units in dark bronze Ares Volcano by Xylocleaf, combined with Porter cabinets in cashmere from Second Nature for the island. The worktop, complete with a moulded sink for a truly seamless look, is pure white Glacier by Corian. The sleek look is further enhanced with the handleless doors and smart brushed aluminium rails used vertically for the tall units and horizontally for the island cupboards. Within the tall bank of units are four tall larders – one open and one a pull out tandem larder, a Neff N50 larder fridge and N90 freezer and additional Neff appliances including an N70 combination oven and microwave, N70 compact steam oven and two N70 slide and hide single pyrolytic ovens. Included within the island design is a Neff N90 black glass flex induction hob and worktop downdraft extractor, a Neff N50 fully integrated dishwasher and a Quooker Fusion Flex PRO 3 combination tap for boiling water, cold water and filtered water. Meridien Interiors works closely with architects, developers and private clients to provide luxury, showhome quality, kitchens at trade prices. For further information about Meridien Interiors’ kitchens and bedrooms, please visit www.meridien-interiors.co.uk or call 01202 216688. Or call into the Meridien Interiors showroom at Unit 62, Azura Close, Woolsbridge Industrial Estate, Three Legged Cross, Wimborne, Dorset BH21 6SZ.